Home Retail Industry Do Retailers Need to Increase Foot Traffic? By any measure, empirical and anecdotal, the number of people visiting retail stores is down. There are plenty of theories about why: it’s the mass movement of shoppers to online; it’s changing consumer trends; it’s the weather; it’s those pesky, hard-to-figure-out millennials who would rather hunt for the nearest craft brewery than bargains at the mall. As someone who has studied brick-and-mortar store traffic trends for more than twenty years, I know it’s not unusual to see year-over-year store traffic declines of 5, 10 and even 20 percent or more. When you put this in absolute terms, it can be startling. So, do retailers need to increase foot traffic? My team of analysts and I analyze store traffic from thousands of retail stores across North America. A couple years ago, we analyzed the store traffic data from a 600-store specialty retailer. In 2015, their stores averaged about 200 traffic counts per day, which over the course of the year adds up to some 43 million visits. But for the first half of 2016, the chain experienced a 7 percent decline in store traffic—or about 1.5 million fewer people visiting their stores. Ouch. I agree that declining store traffic is a real concern and that it may be difficult, if not impossible, for some retailers to increase foot traffic. However, there’s a lot retailers can do to improve their results despite lower store traffic. Retailers that don’t have traffic count data are literally flying blind. Or worse, they use sales transaction counts as a proxy for store traffic—so they think they know what their store traffic is, when they actually do not. Retailers are always talking about how they plan to deliver better financial results by improving ‘productivity’ in their stores. Here’s the catch: you can’t calculate conversion rates or traffic productivity unless you actually count store traffic. If you’re one of those ‘the earth is flat’ misguided retailers that still uses transactions as a proxy for traffic, forget about everything you just read. You don’t have the data to create these important insights. Many factors influence productivity: inventory/merchandising, promotional activity, and labor/scheduling. Yet, retailers today are rightly hyper-sensitive to wage expense. Excessive wage costs will kill profitability, but understaffing and/or misaligning labor can be even worse. Not having enough staff at the right times impacts conversion rates and immediate sales that can add up to many millions in lost sales annually. It also creates a lousy in-store experience that can turn a once-happy customer into a social media terrorist bashing your brand, leaving a permanent digital scar. Declining store traffic is a serious concern. However, it is hard to have sympathy for retailers who squander their store traffic. These are self-inflicted wounds resulting from ignorance or arrogance. Even in a world of declining store traffic, there are a number of things retailers need to do. The five most important are listed below. 1) Get serious about measuring traffic in ALL of your stores. If you don’t have traffic counters installed in all your stores, install them now. Having traffic counters in only some of your stores and extrapolating results across your chain is imprecise. If you use sales transactions as a proxy for store traffic, stop it. It’s just wrong and reckless. If you have traffic counters installed in your stores, but you don’t believe the data or the data is sketchy, clean it up and keep it clean. 2) Understand your sales drivers. Map performance of every store by breaking results into the underlying drivers: traffic, conversion rate and average sale. Without breaking them out, you’re guessing—and very likely to make the wrong decisions. 3) Focus your store and district managers on driving conversion and average sale. Store/district managers cannot control or increase foot traffic, but they absolutely influence conversion and average sale values. Provide your managers with easy-to-digest insights on traffic/conversion/average sale results, train them on what to do with the insights and then hold them accountable for results. 4) Stop understaffing your stores. What’s the point of driving traffic to the store if you don’t have enough staff to service it? Make rational allocations of labor for each store based on the traffic volume it receives. Establish optimal staff to traffic ratios and then staff accordingly. 5) Rationalize your store base. Review long-term traffic trends and conversion/average sale productivity of every store. 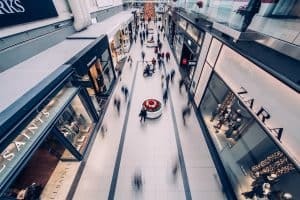 If you have stores that have significantly less traffic opportunities, either invest marketing dollars to try to drive up traffic, or close the store. High productivity won’t matter if you have no traffic. This post was originally published in 2016 and was updated April 3, 2018.